Whether you're talking just with that special someone or figuring out Friday night plans with the whole gang, Hangouts are like real-life conversations. You can show photos and share how you're feeling with emoji. See when your friends have read your messages and when they're typing back. If a friend isn't available when you try to reach them, they'll see an alert next time they connect, keeping your conversations alive. Finding your ongoing conversations across devices and picking them back up is simple. And you can scroll back through past Hangouts to re-live what you talked about - from those epic trip photos to that nice note from a friend when you were home sick. Sometimes you just need to laugh out loud. Turn any Hangout into a live video call with up to 10 friends or simply choose a contact to start a phone call from your computer. Who says you can't be together even when you're not? With one touch, you can start a video call with one friend or a whole bunch. Video calls ring everywhere your friends have Hangouts. Whether they're on their computer, phone or tablet, they'll know you're calling. If they're not around or can't pick up, Hangouts will let them know you were trying to reach them. From Hangouts on your computer, just type in a phone number or pick one of your contacts. Once you're talking, it's easy to add more people and start a conference call, turn your conversation into a video call, or add fun sound effects. Best of all, calls placed to the US and Canada are free, and calls to other countries have super low rates. Don't worry about what kinds of computers and phones your friends use. Hangouts works across computers and on Android phones and tablets, iPhone, iPad and iPod Touch. So you can connect with everyone, and no one gets left out. 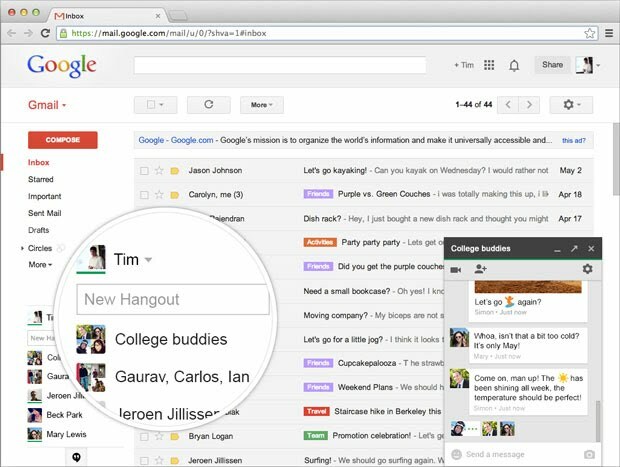 Hangouts works right inside of Gmail. Take a break from email and send some emoji or call your friends. You can upgrade Chat to Hangouts by clicking on your photo icon in Gmail's chat list. You and your friends can now message each other with Google on your Apple devices. Hangouts works great across iPhone, iPad and iPod touch. Once your Hangout On Air is over, it's easy to keep the conversation going. 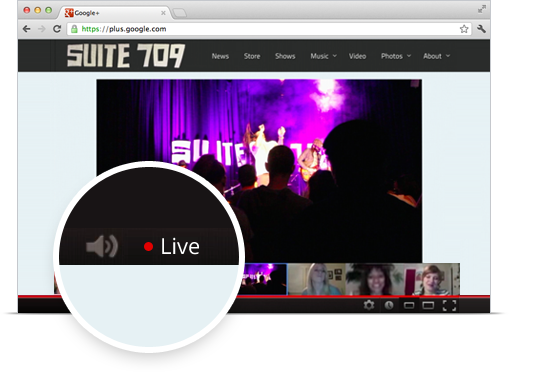 The recording will be publicly available on Google+ and on your YouTube channel, ready to be shared. Check the schedule of upcoming Hangouts On Air and find a diverse list of interesting broadcasts to add to your calendar.